It's been a rough couple of years for owners of the iconic clothier. 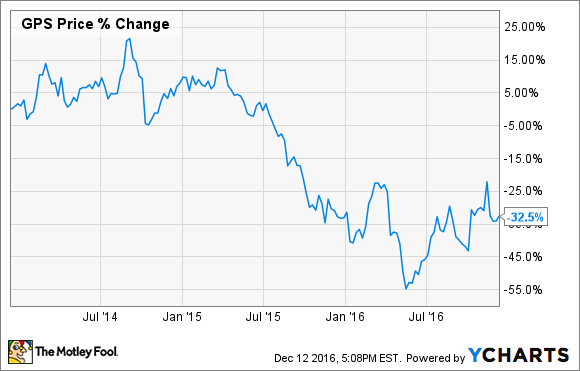 After a post-election bump, clothing retailer Gap's (NYSE:GPS) stock has retraced its steps backward. And rightfully so, as the company has continued to struggle against revenue and comparable-store sales declines for the second year running. Now that Gap is deep into a restructuring plan, will the story change for the company in 2017? Consumer shopping habits and fashion trends have been in flux, and the Gap family of companies has struggled to keep up. As a result, the company hasn't had a quarterly same-store sales increase since the fourth quarter of 2014. Data source: Gap monthly comparable-store sales. Chart by author. The fourth quarter of this year hasn't started out much differently, with November comparable sales declining 1%. The decreasing foot traffic at the company's stores has eaten into revenue, which has been steadily declining since 2014 as well. In the third quarter, Gap reported a 2% decrease in net sales. Shareholders may not be happy with the clothier's performance, but the problems Gap has been facing aren't unique. Shoppers have been opting out of trips to the mall, instead hopping online or going with "fast-fashion" value names such as Urban Outfitters and H&M. Art Peck, the former head of Gap's digital efforts who was involved with the purchase of Athleta, took over as CEO in the fall of 2014 and has been implementing changes to right the ship. With the company a couple of years deep into its restructuring, 2017 is hoped to be a turning point, though turnaround efforts haven's sparked big success yet. One of the primary changes Gap has been implementing is shifting from a "buy-in-advance" clothing supply model to one that's more adaptive to changing trends. This change was aimed at helping the company keep product fresh and constantly changing, a shot at catching up with the fast-fashion retailers that have become popular. Also on the agenda have been ongoing efforts to push the online store. More than just simply closing underperforming physical stores, Gap has been improving the site's performance and adding content to boost shopper interest. Closely related to that has been the push for global growth, especially in Asia, with the digital store playing a key role in that effort. Specifically, optimizing the mobile shopping experience has been an ongoing effort. To date, though, the changes haven't helped move the needle. The Gap family is stuck in a rut at best, and the overarching theme has been a slow deterioration of the business. Despite the ugly numbers persisting, there could be a few bright spots to keep an eye on. Turning over a new page? Revenue is still trending down, but profit for Gap might be showing signs of making a turnaround. The company's profit margin on clothing has improved in the past year after the investments in updating purchasing methods, and other restructuring costs are coming in lower than expected earlier in the year. 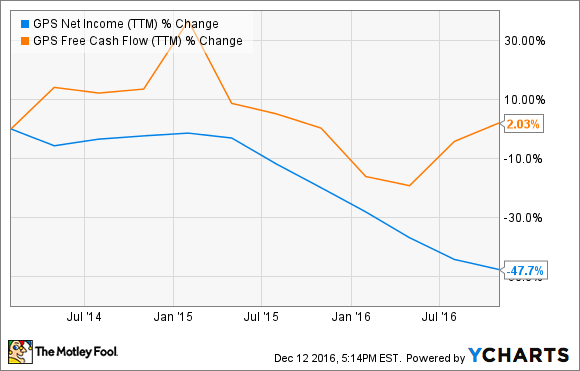 While bottom-line profit is expected to remain under pressure through 2017, free cash flow has notched a recent uptick. Free cash flow is money left over after operating expenses and investments are paid for. GPS Net Income (TTM) data by YCharts. As the company progresses through recent changes, it stands to reason that free cash will increase and profit will eventually follow. If that transpires, it would bring much-needed relief to owners of the stock. It's worth keeping an eye on those measures. However, the sales problem is being stubborn and looks like it will stick around for a while longer. Until the old retailer can find an answer to that problem, Gap stock will continue to struggle as it has over the past few years.